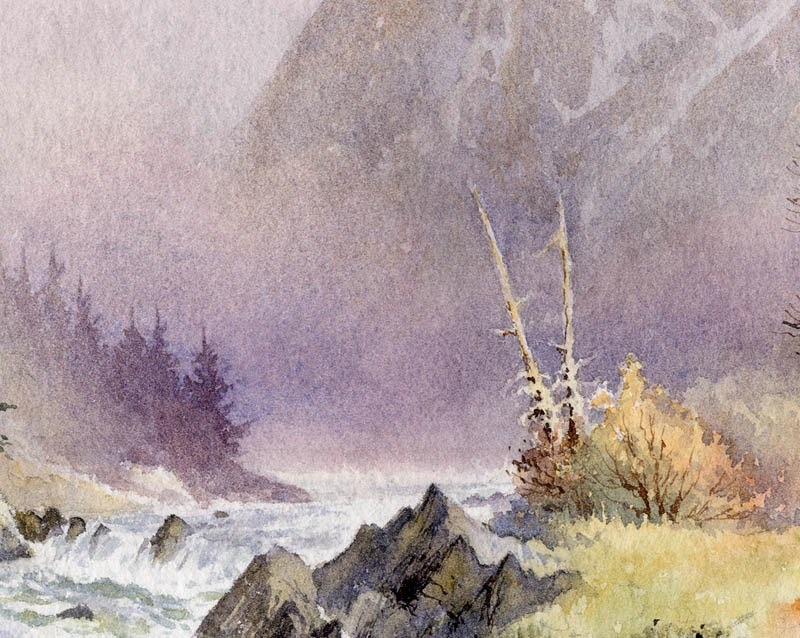 One lovely technique in watercolour painting is to float two colours into each other and allow them to merge, sometimes adding more of one colour or other while they are still wet, and then working a dark shape up against them when they have dried. This can really make your work sing, whether you paint landscapes, still life, flowers or figures. In this small section of a painting the bush on the right-hand side has been painted by washing in two colours side by side – cadmium orange and light red – and letting them blend in. Later I painted in the darker purple-grey to the right of the bush, taking it up to the top, in a hard edge, while allowing flecks of the original colours to remain here and there. Afterwards I added the shadow under the bush and finally the branches. This approach gives a rather pleasing variegated effect to the subject and is worth practicing. For details of the exhibition see www.jmt.org/wild-space-gallery-shows.asp or telephone 01796 470080 or email jane.grimley@jmt.org The Highlands in spring are absolutely magical, so why not make it a wild painting break? This entry was posted in atmosphere, David Bellamy, watercolour demonstration, wet in wet technique by David Bellamy. Bookmark the permalink.